Thank you for the overwhelming donations again this year for the Angel Tree gifts for the children in foster care. Gift items included sports balls, toys, coats, clothing, accessories, and $180 in gift cards. 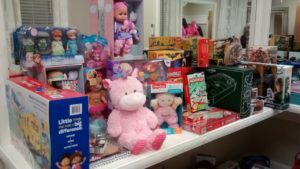 Foster Care Support Foundation volunteers came and loaded 34 sports balls, 62 toys (including games, craft sets, lego sets, dolls, action figures), 42 winter coats, and 150 clothing and accessory items (including tops, shirts, pants, outfits, hat/glove sets). That’s a total of 288 items for these special children!